This first step in replacing your vinyl liner is choosing a new liner that will match with your exsisting pool. We recommend that you stay with the style liner that you previously had in the pool. What size pool do you have? If you are not absolutely sure, then take a tape measure and measure the diameter of the pool for round pools or the length and width for oval pools. You will want to measure from the inside wall to the opposite inside wall. Liner measurements are always taken by measuring the actual swimming area, not the outer framework. What type of liner do you currently have? Liners come in 3 different models: overlap, U-bead, and J-bead. Though this may seem confusing, it is very easy to determine which of these liners you have. Overlap: If you have an overlap liner, then you will see liner hanging over the outside of the pool wall. Sometimes you will have to bend down and look under the pool’s toprail on the outside of the pool, because the overlap may be rolled up to hide the excess liner. U-Bead: If you look underneath the pool’s toprail on the inside of the pool and see the liner “stuffed” into either a metal or plastic tracking system, then you have a U-Bead. J-Bead: A J-Bead liner has its own track attached to the liner to hook directly over the wall. If you do not find that you have an overlap or a U-Bead, then you have a J-Bead. What is the height of your pool wall? U-Bead and J-Bead liners require a specified pool wall height. 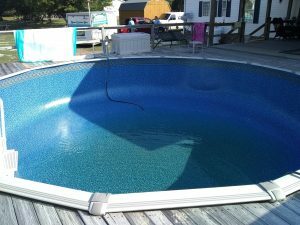 This will be 48″ or 52″ (you could possibly have a 54″ wall if you purchased your pool after 2009, but these pools are very uncommon). To determine this you will have to measure the OUTSIDE pool wall height. An inside measurement will not be accurate because you will have a few inches of sand on the pool floor. Measure from the bottom of the pool frame to the top of the wall, just underneath the toprail. You will not need to determine pool wall height is you are purchasing an overlap liner. Siphon with your garden hose. This is the most common way to drain the water down. It involves the good old fashion way of placing one end of the garden hose in the pool and sucking on the other end of the hose until water begins to flow through. You then can drop the end of the hose that you are holding onto the ground and a siphon will continue. Keep in mind that for the average 24′ above ground swimming pool this may take 4-5 days to drain, so if this is the technique that you choose to use, make sure you begin draining well in advance of our scheduled replacement date. Drain using a sump pump. Many of our customers own a sump pump (cover pump) that they use to drain water off of their winter covers during the winter months. If you own one then attach your garden hose, plug it in, and drop it in the pool. Depending on your size pump this can take several hours or a day or two. You can purchase sump pumps at your local hardware store from $30 to $100, depending on the size pump you choose. You can also rent a sump pump from a local rental store for usually around $30 to $50 a day. DO NOT puncture the liner and let the water soak into the ground. This will take weeks, if not months, to drain the pool completely depending on the size hole that is punctured. If the hole is punctured too large, water can drain too fast and potentially damage the swimming pool. This can also soak the floor underneath the pool and make it impossible to level the floor during replacement. You can, however, dig a trench under the pool wall and cut the liner so that the water flows outside the pool area. This should only be done when the pool contains less that 6 inches of water or major damages to the pool may occur from the excessive water current. The old liner will be cut into smaller pieces and removed from the pool. We will place the old liner parts by your curb for the garbage men to pick them up. If you do not have garbage pick up then you will want to arrange means to dispose of the old liner. The sand floor will be resmoothed, cutting the humps and filling in the dips. The pool floor usually consists of 1 to 3 inches of sand so that sand can be taken from the high points and distributed to the low points. New sand will not be furnished unless requested by you during the scheduling process. The top of the pool will be removed for liner installation. If you have a deck that covers the top of the pool, then you will need to inform us before we schedule a date for replacement. The liner will be installed and vacuumed against the pool. Water will be used to begin filling the pool. Make sure that you have a spigot and garden hose for the filling. The top of the pool will be reinstalled. The skimmer and return will be installed. The pump and filter will be hooked up to the skimmer and return. When we complete the job, the pool will have an inch or two of water and it will be your responsibility to continue filling the pool and applying the chemicals.